The Vector Europe 00/HO controller will come with Euro/Schuko 2 pin mains plug fitted. A UK type 13 amp plug is fitted for Eire. Other types of mains plugs can be fitted on request. For 'H0' '00' and 'N' gauge layouts. State-of-the-art design, electronics, and construction, offer the very best in performance and capability. Each 220/240 volts AC mains-powered controller, is designed with twin transformers, to supply correct voltage to each track. Automatic re-set 1.1 amp circuit breakers protect against overload. Mains lead 1.2 metres long. 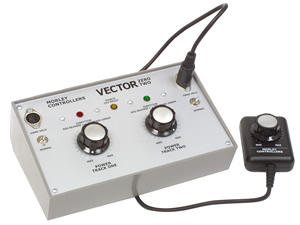 Unique to Morley, the Vector is designed with an on board heavy duty points Capacitor Discharge Unit (HD/CDU). When used with the correct switch it will activate the points motor giving it a firm, positive, short burst of current. Being of short duration it prevents motor from burning out. A "points CDU ready" yellow LED indicator is situated on the front panel. The screen-printed front panel gives perfect indication of the settings of switches and controls, supported by LED indicators, a dual LED for power and direction, plus the CDU LED. Centre off power controls provide locomotive direction change, together with perfect smooth control at slow speeds as well as fast. A 12Volt uncontrolled accessory output is provided with protection from a 1 amp circuit breaker. Two hand held units are included with centre off controls providing power and direction change. The length of cable on each unit is 2.5 metres. Desk type dark grey case with sloping aluminium front. Fully tested and guaranteed for 5 years. We manufacture in the UK. RoHS compliant. Based on the information provided by our by our component manufacturers, the Vector does NOT contain the substances restricted by the RoHS legislation at levels over the maximum concentration values. Components tested to 105 degrees centigrade. Suitable for N, OO and all small gauge layouts. 1 x 12 Volt DC accessory protected by 1amp circuit breaker. On-board Capacitor Discharge Unit (HD/CDU) for points motor operation. Dimensions:215mm wide x 130mm height x 75mm max depth.